The Richmond Commission on Aging and the Community Services Department Presents…. DECEMBER 2017 MARKETPLACECONTRACOSTA.COM 71 Grace Eldercare We Care Faithfully 24 Hour Care with Professional Caregivers on Site License #075601110 Grace Eldercare is dedicated to provide true stability and continuity for our Residents. A loving place to call home, surrounded by serene gardens. Situated in El Cerrito: a charming community in the San Francisco Bay Area. Our values and beliefs are based on integrity, dignity and compassion. We are a small facility, which allows us a personal approach in treating people with kindness and respect. Couple Living Available Husband/Wife (510) 233-9693 • graceeldercareelcerrito.com COME DANCE! 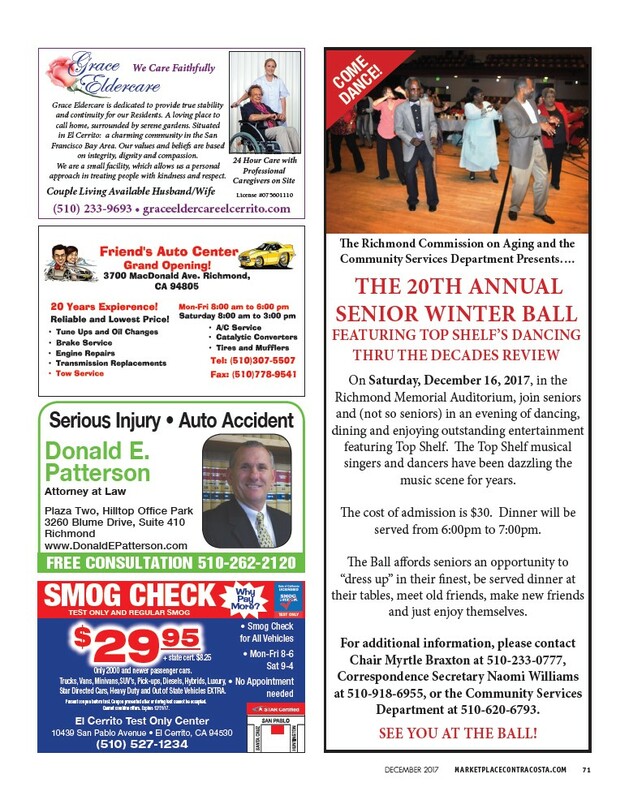 THE 20TH ANNUAL SENIOR WINTER BALL FEATURING TOP SHELF’S DANCING THRU THE DECADES REVIEW On Saturday, Decem ber 16, 2017, in the Richmond Memorial Auditorium, join seniors and (not so seniors) in an evening of dancing, dining and enjoying outstanding entertainment featuring Top Shelf. The Top Shelf musical singers and dancers have been dazzling the music scene for years. The cost of admission is $30. Dinner will be served from 6:00pm to 7:00pm. The Ball affords seniors an opportunity to “dress up” in their finest, be served dinner at their tables, meet old friends, make new friends and just enjoy themselves. For additional information, please contact Chair Myrtle Braxton at 510-233-0777, Correspondence Secretary Naomi Williams at 510-918-6955, or the Community Services Department at 510-620-6793. SEE YOU AT THE BALL! Serious Injury • Auto Accident Donald E. Patterson Attorney at Law Plaza Two, Hilltop Office Park 3260 Blume Drive, Suite 410 Richmond www.DonaldEPatterson.com SMOG CHECK Why FREE CONSULTATION 510-262-2120 Pay More? TEST ONLY AND REGULAR SMOG + state cert. $8.25 El Cerrito Test Only Center 10439 San Pablo Avenue • El Cerrito, CA 94530 (510) 527-1234 • Smog Check for All Vehicles • Mon-Fri 8-6 Sat 9-4 • No Appointment needed $2995 Only 2000 and newer passenger cars. Trucks, Vans, Minivans,SUV’s, Pick-ups, Diesels, Hybrids, Luxury, Star Directed Cars, Heavy Duty and Out of State Vehicles EXTRA. Present coupon before test. Coupon presented after or during test cannot be accepted. Cannot combine offers. Expires 12/31/17.